Celebrating the diverse creative talents of jewellery designers working with a wide range of textiles and other tactile materials, Material Girl features jewellery and accessories from seven designers from the UK and Europe, employing materials that include felt, velvet, wool, silk as well as stones, wood, wire, paper and paint. Techniques range from charred balsa wood to delicate embroidery and ‘felting’ of metals such as gold, silver and steel.Kath Libbert explains: “Material Girl features work that I have discovered and admired on my travels over the past few years - the collections are all textile-based, yet vary greatly - and the exhibition is an exciting opportunity to show them all together. Some of the pieces challenge the definition of jewellery, and many criss-cross their way through the boundaries between art, jewellery design and fashion - but above all, this is a collection of beautifully crafted, tactile jewellery that cries out to be held, touched and worn”. 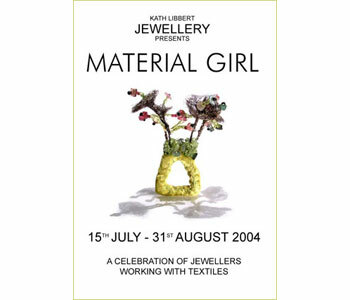 Artists featured in 'Material Girl' are: Ana Hagopian, Barcelona; Karin Wagner, Basel; Beppe Kessler, Amsterdam; Tomasi, Munich; Lynsey Walters, Edinburgh; Julie Arkell, London; Suzanne McCulloch, Liverpool.